Gerry is the developer of a customer experience management model called Top Tasks. Using Top Tasks, an organisation can discover what their users actually want from their website, as it puts the customer at the center, rather than the ego of the company! Each website has a long list of tasks, but there are only a few that are the Top Tasks – these are measured by asking customers what they want, and then ranking them. 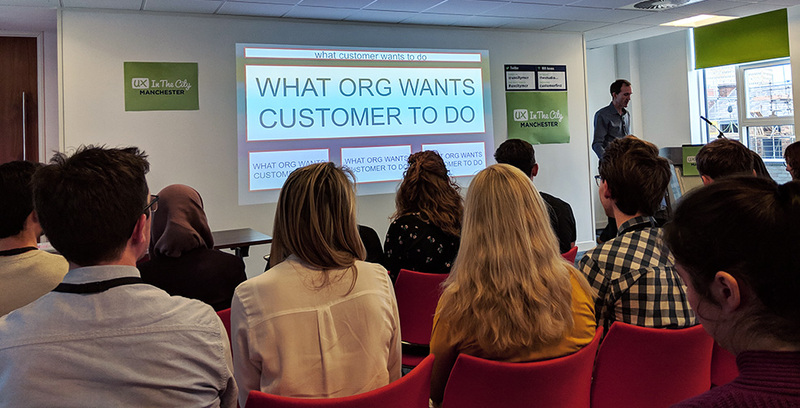 Gerry showed us many examples of data they had collated for different websites, and how the Top Tasks were always different to what the organisation assumed their customers wanted. 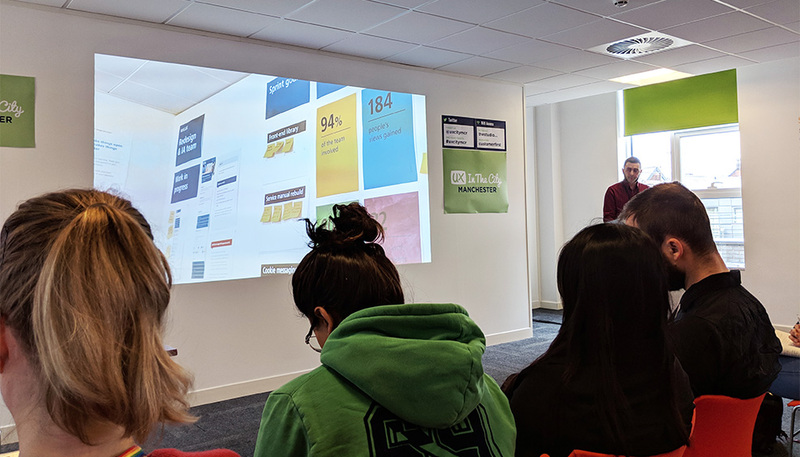 One memorable example was for a Cancer charity, originally their website had lots of calls-to-action to donate so that they could continue to provide their services. But the Top Tasks data showed that their customers wanted to see information about symptoms and types of cancer, along with other educational content. Once they re-designed their website to reflect this, their donations dramatically increased! Dean took on the mammoth task of leading the redesign of the 10-year-old NHS UK website! He took us through his journey – providing us with insight into how he felt at each milestone along the way. It’s important to be confident about the value of design, as over time it can save money, create a better experience for a user and improve a company’s services. As designers, we should be able to rationalise every part of our designs, as every single pixel should be there for a reason. It’s important that simple things, such as alignment of elements on a page, are correct on a built website – as something as small as text being out of alignment on a button can undermine trust, the brand, and therefore the customer’s willingness to use the service. Anastasia gave a thought-provoking talk about how technology is unhealthy for us in the current way we use it. We are constantly stimulated by digital distractions e.g. notifications on our phones, and are rewarded variably with a rush of dopamine. We were never supposed to have so much dopamine though, and so our brains are now wanting bigger doses – we have become dopamine junkies – we’re constantly stimulated and never bored, as our brains have become trained to be used to instant gratification. She also spoke about how multitasking is also unhealthy for our brains. In an experiment, it was reported that after 20mins of multitasking, people were reporting the feeling of stress and their cortisol levels had risen! We cannot come up with creative ideas when we are multitasking – we default to the most obvious decision. A Task Model is, at it’s very basics, outlining the steps people go through and the tasks they do to complete a goal. 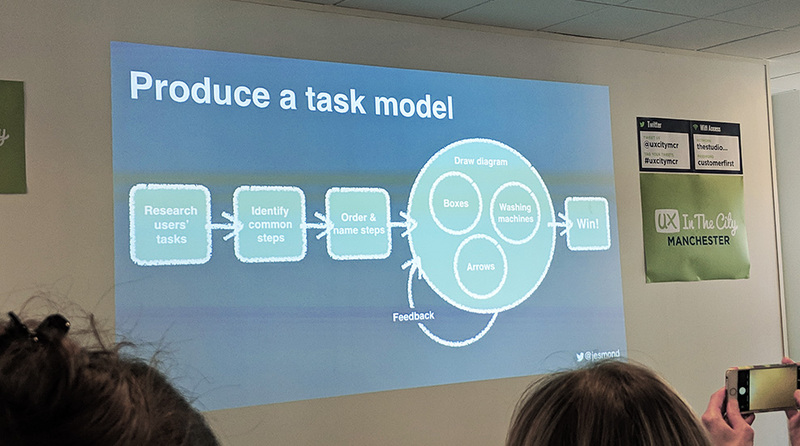 We were shown examples of Task Models that had been put together for e-commerce websites, and Jesmond went into detail about the importance of these tasks being planned out – because humans complete tasks in a certain order, and incomplete tasks trigger stress. Humans fixate on their task at hand… until it’s complete, and then they move on. Jesmond show us a real life example of using an ATM machine – in the past the task model would be that you take your cash before taking your card, but this meant that people kept leaving their card in the cash machine, because they’d completed their task of drawing cash out! This meant that the task model was changed so that you have to remove your card before taking your cash – meaning the very last task you do is the task that completes your goal. 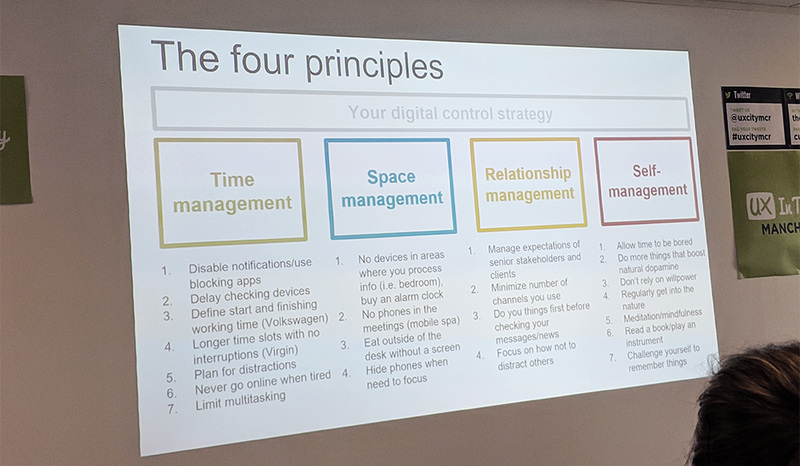 It’s important that we think of the tasks a user takes in order to complete their goal when visiting a website, and making sure we lower the impact of interruptions on the user, to ensure we’re not causing stress for our customers! Hey! I'm Carrie, one of the Web Designers at Carbon.